You are currently browsing the tag archive for the ‘1971’ tag. It seems that in the early 1970s Soviet Propaganda took a rather retrograde course, being more overtly propagandistic and using images that went all the way back to the 1920s. 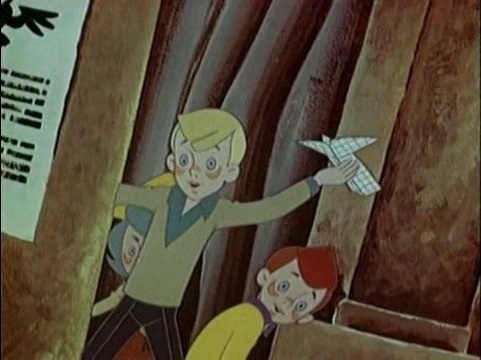 Films with a peaceful message, like ‘Proud Little Ship‘ (1966) or ‘We Can Do It‘ (1970) were interchanged for self-important glorifications of the Soviet Union, and its ‘heroic’ history. This period produced some of the most terrible propaganda films ever made. ‘The Adventures of the Young Pioneers’ is a prime example. The film plays during World War Two, Russia’s Great War. When their village is occupied by some goofy Nazi Germans, three communist children decide to withstand their occupants. They are betrayed by a collaborator, however, and captured when raising a red flag. Luckily, they are saved by the red army. This children’s film uses ugly designs and very old-fashioned looking caricatures of Nazis, while the children and especially the red army are drawn quite heroically. The result is as unappealing and unfunny as it is sickeningly propagandistic. One could see ‘Songs of the Years of Fire’ as the Soviet answer to ‘Fantasia’. This propaganda film features songs from the Russian civil war (1917-1922). 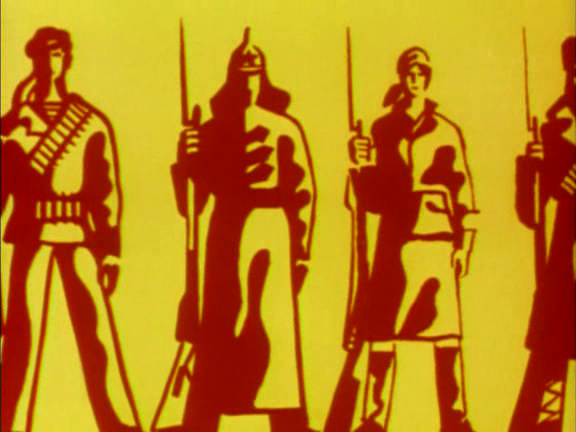 These songs are accompanied by revolutionary and shamelessly patriotic images of the brave soviet army, to which the film is dedicated. The resulting film is as graphically interesting as it is boring and sickening. It’s hard to believe such blatant propaganda could be made as late as 1971.